Practical everyday tips, accommodations, and strategies to help support kids with hyperlexia. Raising a child with hyperlexia is full of fun surprises and quirks. However, sometimes simple day to day activities like leaving the house or bath time can be particularly challenging for these kids. So I asked other parents in my hyperlexia Facebook group what some of their current struggles are and paired them with some of the struggles that we have encountered with J to compile a list of common daily life challenges. I've also included a detailed list of strategies to try for each of those issues so that you can hopefully find a strategy or accommodation to help you and your child. 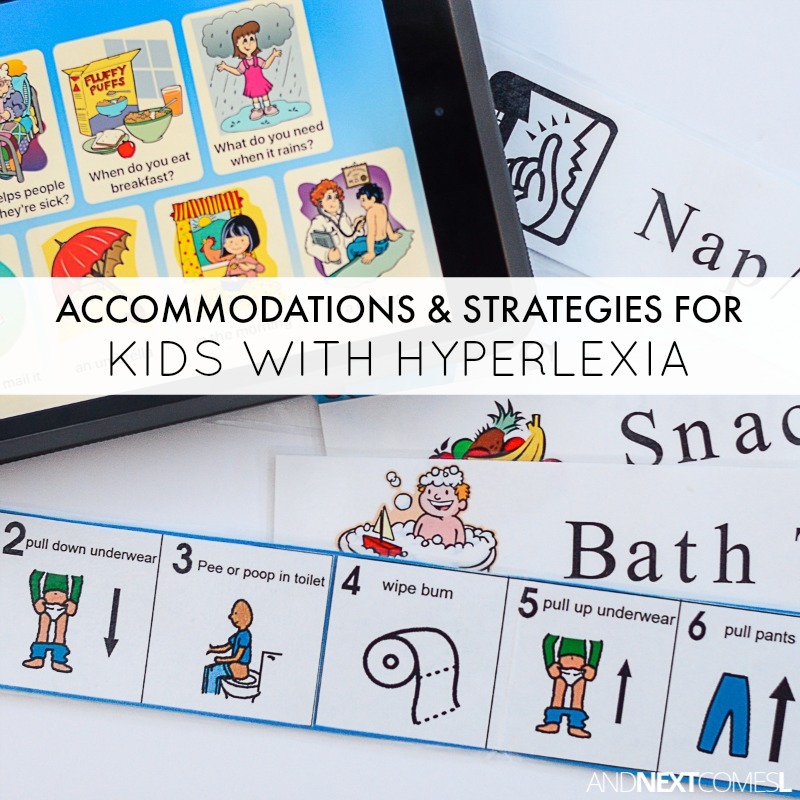 Here are some practical strategies and accommodations for kids with hyperlexia to tackle those day to day challenges! 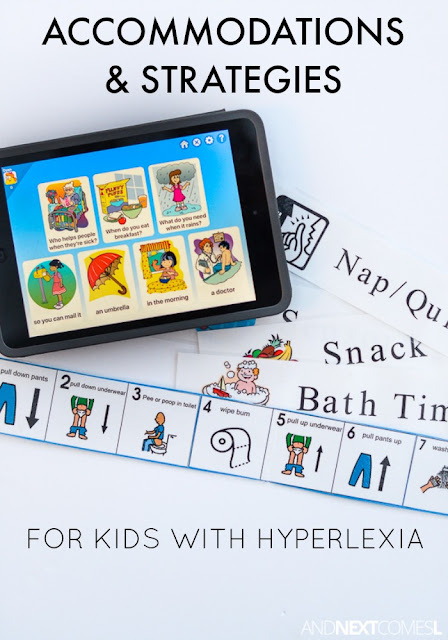 In this post, I cover five daily challenges, but cover an additional 25 in the eBook Beyond the Letters: Everyday Strategies to Help Children with Hyperlexia Learn Language and Social Skills. I remember when J's hyperlexia first became apparent to us it was because he would play with his letters all the time. ALL. THE. TIME. Alphabet magnets, alphabet puzzles, alphabet cookie cutters...alphabet, alphabet, alphabet. He would never build towers, play with LEGO bricks, color and draw, or drive cars around like other kids would. Instead, he would use those toys and turn them into letters and numbers. So how can you encourage your child's play beyond the letters? Well, I am not one to discourage fascinations or take away toys that are obviously used for stimming for J. Instead, I focused on tying those favorite toys into new and novel ways to play with other materials and eventually those toys could be gently phased out of the play. Basically, I would take his interest and use it to get him interested in something new. Or to at least try something new! Poor and awkward conversation skills were the huge red flag for us and the main reason we knew something was going on with J. How could our child read so amazingly well, but couldn't carry on a conversation with us? And when he did try to engage in a conversation, why was he always out of context or saying really random things? Having a conversation with him was difficult and awkward. I've already covered this particular topic in more detail in the post Conversation Skills in Kids with Hyperlexia, where I shared a majority of these strategies in more detail. Pronoun reversals are common in kids with hyperlexia. J still mixes up his and her occasionally, but he was 5 1/2 before he started using the correct pronouns for himself and using he/she correctly. Up until that time, he would say things like, "J have a try" instead of "Can I have a try?" So if your hyperlexic child is still mixing up pronouns, then no worries. It is common and eventually gets sorted out, but there are definitely lots of different things you can do to work on pronouns. Sensory issues are extremely common with kids who have hyperlexia, especially those that have an autism diagnosis as well. As a parent, it is important to have a strong understanding of the different sensory systems so that you can better target your child's sensory issues. So I highly recommend reading some books about sensory processing. Your child's occupational therapist (if applicable) can also help highlight your child's sensory issues. Leaving the house was certainly difficult for us most days between the ages of two and four and a half. Our struggles usually revolved around clocks and the time never being exactly the same time on each clock. Or we were only allowed to leave the house at a precise time as defined by J. It was definitely a big challenge for us! Calculators were also a lifesaver for us! J would happily go anywhere with us as long as he had a calculator to play with! Need More Practical Strategies to Try? This post is part of a monthly series called Parenting Children with Special Needs. This month's topic is daily life and you can find the other posts regarding this topic below. This is fascinating! I can't wait for your book to come out. These are such great points and fabulous tips! Thank you so much, Renae! I appreciate your support and encouragement. This is an excellent post Dyan. My son is on the spectrum but I suspect there's an element of hyperlexia there too as he ticks all of these boxes. Fabulous ideas to provide immediate help to families - definitely looking forward to your ebook!